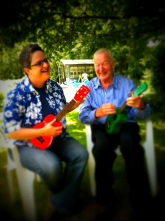 Ukuleles are affordable, cool, fun and easy to play - they bring people from all walks of life together in a magical way! My name is Nicola and I set up Ucanukulele 8 years ago. I had been running the Brighton Ukulele Jam Group and people were asking me for lessons to learn different strums and feel more confident when playing in public. So Ucanukulele was born from my genuine love of this little instrument and the joy it gives me to teach - especially people who have always wanted to play an instrument but never felt they could. Previous students of mine have gone on to join and run ukulele community jam groups. I couldn't be more proud! Last month I attended the Shoreham Uke Jam group and counted 79 people strumming, laughing and singing along together - it was amazing. I have a developed a fun, relaxed and accessible method of teaching. I guarantee that you will be able to play a song, maybe even two, by the end of your first lesson. Youtube is great, but an interactive learning experience is even better - plus I make a great cup of tea! Ucanukulele lessons are perfect for beginners and players who want to explore different strumming/ picking styles. ​Below is a contact form. Ukulele taster event - for up to 25 people - perfect for festival workshops, hen dos, team day work events.